Edward-Alice-Jasper. 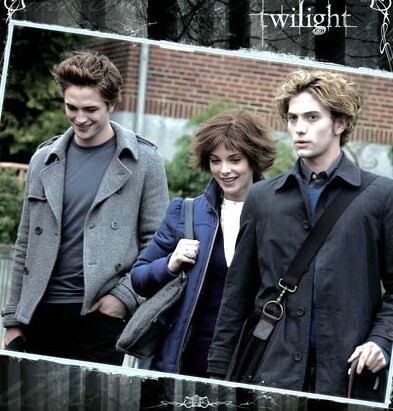 Edward-Alice-Jasper. Wallpaper and background images in the 爱德华·卡伦 club tagged: twilight edward cullen vampire robert pattinson. This 爱德华·卡伦 photo contains 商务套装 and 西装. I cannot wait until the movie comes out!!! but yes, there amazingly gorgeous. 57 days for Australia - December 11th! wow how old are u guys like in ur 20s? oh and jasper is so creepy looking and pail ,all the girls in my class are in love with him japer this and jasper that come on people get a life , jacob/taylor os way hotter then jasper and rob (really dude shave already u dont live in the mountins >:| ) oh and hi austriala girl :) if ur over 16 please don't be my fan its so weird for me being younger then everyone else like this 30 year old is trying to be my fan ....pathetic! you have a bad attitude... and jasper is creepy, but in a good way. he is supposed to be. DUH!!! i didnt like taylor that much. his hair made him really ugly. not really nice of u i really like taylor lautner but jasper is cute! I saw a pic excactly like this except it had bella in it!! plz someone help me i neeeeed to find it!!!! ps anyone have alice and bella wallpaper? Wish I could have Edward's face and Jacob's body for having Bella in my real life.